Filly, colt or foal? What's a filly? What is a filly? This is just one of several words used to describe a horse's age and gender. The word is used to differentiate between a young male and female horse. 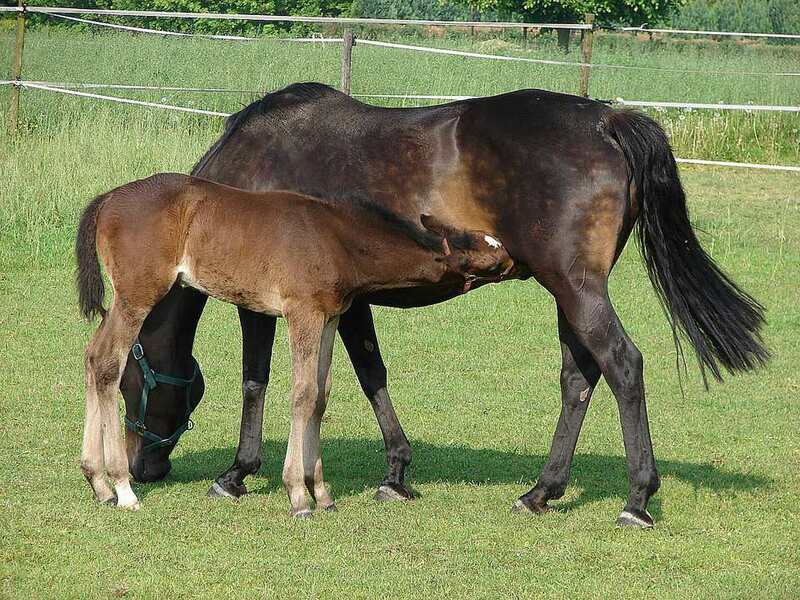 All baby horses are called foal, but a filly or filly foal means that the foal is female. A female horse under four years of age is called a filly. A female horse over the age of four years is called a mare. The plural of filly is fillies. The broodmare had a newborn filly by her side. The colt and filly played in the pasture. Many people feel that fillies are born with a bit more intelligence than colts. Some believe they’re quicker to gain their feet and start to nurse. Whether this is true or not is debatable. There is a belief too that fillies tend to be shyer than colts, but a 2010 study found the opposite. Colts, however, may mature faster than fillies physically, especially if gelded at a young age. Some also believe that fillies are easier to sell than colts, largely because when buying a young horse that is un-gelded, the new owner must commit to the extra expense of castration. Fillies and mares can be spayed, but it is very unusual and a far more complicated procedure than gelding. It is common for non-horse people to call all baby horses colts, but this is incorrect. A female baby is a filly and a male is a colt. Using the word Foal is the correct way to refer to a young horse, of unknown gender, still with its mother. A young horse can be referred to as a filly foal or colt foal. Once a filly is weaned it may be called a weanling filly, and when it reaches the age of one, it may be called a yearling filly. After that age of two, it may be a two or three-year-old filly, but it wouldn’t be uncommon to hear a young female horse referred to as a young mare, even though this isn’t strictly correct. In the horse racing world, the word filly has a slightly different meaning. In a race, a filly may be any female horse running under the age of five years old. The riding horse world rarely makes this distinction, partially because horses aren’t really ridden except in training before they are four years old. If a horse show class is specifically for fillies, the young horses will likely be shown ‘in hand’, that is not being ridden. Young donkey, pony, mule, zebra, onagers and other equine relatives may be referred to as fillies as well. According to the Merriam-Webster dictionary, the word filly has been used in English since the 15th century. Its roots are in the Old Norse word fylja for female foal, that evolved to the Middle English word filli and is also similar to the Old English word for foal. The French word fille has similar roots. In English, a slang way of saying girl may be to refer to her as a filly. In Australia, Champion Fillies day is celebrated with entertainment, food, fashion, and racing.